In a previous post, I covered how to create a block in AutoCAD. Here I explain how to insert a block. Go to Home tab> Block panel> Insert to start the INSERT command and open the Insert dialog box. From the Name drop-down list, choose the block that you want to insert. The list contains the names of all the blocks in the drawing. In the Insertion Point section, you would usually leave the default setting, which is to specify the insertion on-screen. However, if you know the coordinates, you can deselect that option and enter the coordinates. You might do this for a title block that you want to insert at 0,0. In the Scale section, you can pre-specify a scale. By default, the Specify On-screen option is not checked. You’ll still be able to specify the scale after you return to your drawing, but before you specify the insertion point. Again, if you know the scale you want, you can enter X, Y and Z scale factors in this section. By default, the Uniform Scale checkbox is checked, which means that the same scale will be used for X, Y and Z directions. Uncheck this checkbox to use varying scales for the 3 dimensions. In the Rotate section, you can pre-specify a rotation angle. By default, the Specify On-screen option is not checked. You’ll still be able to specify the rotation after you return to your drawing, but before you specify the insertion point. Of you know the rotation you want, you can enter an angle in this section. Sometimes, you may want to explode the block when you insert it. For example, you might want to change the block. Of course, you can explode the block after insertion, using the EXPLODE command, but the Insert dialog box gives you a shortcut. Just check the Explode checkbox at the lower-left corner. Click OK to close the dialog box and return to your drawing. Basepoint: Freezes the location of the block to let you temporarily change the block’s basepoint. Keep the cursor in the drawing area as you do this, so you can specify the new basepoint. Note: In the Insert dialog box, the path and block unit information are not editable. The Locate Using Geographic Data is only available if you have added geographic data to the drawing and if the block (in this case another drawing) also has geographic data. Open the Insert dialog box as just described and click the Browse button. For example, you may have created blocks as individual drawings which are part of a block library. Navigate to the drawing, select it, and click Open. You’re now in the Insert dialog box. Use the dialog box settings in the same way you would for a block inside your drawing and click OK.
At the Specify insertion point or [Basepoint/Scale/Rotate]: prompt, specify the insertion point for the block, using the options if you want. Do you have any tips on inserting blocks? Leave a comment and let other readers know! i have a door block in my drawing, i’m looking for a way to change the basepoint for the door without loosing these doors to her locations and positions. 4. select all of the blocks and move them from the 2nd point to the 1st point and they’ll all move back. You could accomplish the 4 steps with an AutoLISP routine that cycles through the blocks, but I’m not a programmer. Let me know if this works. I am using Autocad 2012 and am setting up a workspace, I wondered if there was a way to set a toolbar command for inserting blocks and set it to browse to a specific location so that a user doesn’t have to browse for the blocks. The users are no keen on tool palettes and prefer tookbars..I have a macro ^c^cinsert but do not know what else to put in the macro for it to be set to a specific location. are you able to help me please? I am working with auto cad 2000, trying to copy one dwg to a new frame, easy right? But it is coming so big, and when I do a zoom ext. I can see my new frame very small in a side of the screen. Maybe scale? can you help me? HAI I AM WORKING WITH AUTOCD 2013, I NEED ABOUT HOE TO CREATE LAYOUTS AND HOW TO INSERT TEMPLET IN LAYOUTS. Hello! Can you tell me how I can modify only one of same blocks in same drawning without explode-command? Same style like edit block in-place but it changes only one block????? Block has converted from microstation cell to dgv. thanx! I understand how to adjust the size of the viewport window, on setting the scale inside the viewport window, selecting the printer and paper size, and then enabling the viewport window (double clicking inside of it) in order to move the cad around/position it. For the (b) case, when I go back to Model space, the cad done does not show up in Model space (this is nice for annotations particular to the Layout). But for the (b) case, the cad does show up in model space. OK… so here is my problem. I would like to insert one of my border drawings (as a block) into the Layout View. BUT, I don’t want it to show up in Model Space. Since I might have multiple viewports for a given Layout tab, and I might have multiple tabs; it is therefore a mess when an inserted block in the Layout also shows up in model space. However, this is exactly what happens for me. I should note that the only way I have figured out how to insert a block in the Layout View is with the “a” approach, ie with the window enabled/double clicked inside. If I could even solve this by inserting the block on a dedicated layer, and then figure out how to keep that layer on/unfrozen in the Layoutview, but off/Frozen in the Model Space view… that would work for me too. But I can’t figure that out either. I’m not sure about the Mac version, but you should be able to insert any object, such as a title block and border in paper space. that is, using (b). Those objects won’t appear in Model space. Open the block in the block editor and save as another name. Make your edits and save again. Close the block editor, erase the block that needs to be changed and insert the new block. I don’t think you can edit a single occurence of a block. You can change scale, rotation, etc. of a single block with the Properties command. I think you will have to define a new block with a different name if you want to change someting that’s not defined in the Properties box. 1.here are the steps to acheive your goal. 10. Save the changes and close the bedit. I am trying to insert a title block which was created by AutCADLT into a new layout PS. When I complete the insertion process the sheet is no where to be found. It does not matter that it was created with Autocad LT, unless maybe if it is a newer incompatible version of Autocad. If that is the case, with the correct abject enabler installed, you should still see the block, but you won’t be able to edit it. I suspect that in the original drawing, the title block is in paper space. Autocad will only insert items from another drawing which are in Model space. Anything drawn in paper space will not show up when it is inserted as a block, into another drawing. Open the original drawing of the title block and verify it is in model space. If the title block is in paper space, copy it from 0,0 into Model space at 0,0. You can create a view port in paper space at the scale you want the title block, and then use the chspace command which will move it from paper space to model space and scale the title block according to the scale of the view port. can i write 2 or more blocks ( such as a door and the other is a window) in a single drawing sheets, and use them in other drawing sheets numerous times. what and why there is a deference between copy a block and insert a block in scale size? the copy order make the block perfect size. the insert order make it smaller. Nice tutorial. Blocks are very useful tool in AutoCAD. can you plz tell how to insert plans of sinks and other fixtures of toilet frm autocad library?? XREFs have not changed much between 2002 and 2015, if at all. You can open the XREF window by simply typing “XREF” or “XR” (without the quotes) in the command line. Additionally, if you hit the F1 key to open your help, you can search for XREF and learn almost everything there is about XREFs as they relate to your version of AutoCAD. In Tool Palettes you can use exiting blocks, or create your own palette and save your blocks for use in other drawings without having to open the drawing where the blocks reside. In AutoCAD 2015 Vanilla when I try to insert a block I have to selec more options to the the insert dialog box. Why did they change this. We are currently working on Autocad LT I want to create a library with all the block symbols that we use on Scale 1:1, I want to know if there is a option for when I bring the block in from the library that you can immediately set the scale of that block to your current drawings scale? I believe you need to make the blocks annotative in order for the blocks to insert at the current scale. Hi, im a geologist and im having trouble insterting a block that is an exported dxf file from surfer. The block contains groundwater elevation contour lines that are specifically scaled to the (x,y,gwe) gwe = “z plane” = groundwater elevation for the monitoring wells. They are all supposed to match to the aerial view of a gas station we constructed on cad in order to show how the direction of underground groundwater flow. We are running the ancient Autocad LT 2000i. Everytime I add the block it shows up extremely small…like thumbnail sized even when trying to resize the block i cant get the elevation contours to match the Monitoring well elevations. Do you know of a way i can troubleshoot around this have the block show up full size? Hi Dave look in your help for INSunits setting 1 to 4 corresponding with mm to Feet and change the setting or open the block.dwg and change units. 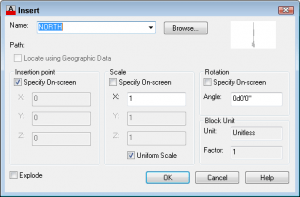 I’m using autocad 2012, the scale option – Uniform Scale checbox is not be checked, whether it be different? and what Explode function in the INSERT dialog box ? Hi! Ellen, You are the most valuable person because your site is more valuable. so best of luck. i would like to know how we use insert block without clicking by mouse only use the command. IF I WANT TO rescale the block in to 1:100 or other. what i need to do ? I am still trying to insert. This time it has appear but too big for the paper. What do I do? If you redefine a block definition, all references in that drawing are updated automatically.